The Library has the answer for all your mobile WiFi needs, the Verizon Jetpack. 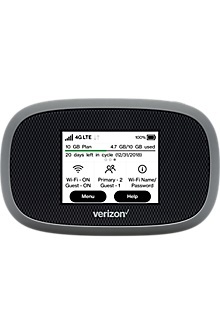 With the Verizon Jetpack you can stay connected, on the go, on vacation, during power outages, anytime you need access to the internet and you know it won’t be available otherwise. The Library has two Verizon Jetpacks available for borrowing. For more details or to check a Jetpack out, come on in to the Library. This entry was posted in news on April 12, 2019 by Kevin Bourque.